Retailers nationwide are looking to make Black Friday safer a year after a wall of frantic shoppers trampled a guard to death at a Walmart store on Island. Wal-Mart Stores Inc. is among companies instituting new procedures after the death of security guard Jdimytai Damour. The company is keeping its stores open 24 hours on Thanksgiving Day. That will make it unnecessary for shoppers to converge outside for pre-dawn openings. "No price can be worth someone's life," said shopper Victoria Rogers, of Queens, on a recent visit to the same store. One year later, Wal-Mart Stores Inc. is embroiled in lawsuits, appealing citations and instituting company-wide changes, including staying open 24 hours on Thanksgiving, and has inspired voluntary federal guidelines outlining what other retailers should do to avoid the same result. "What happened is tragic, and we're still saddened by it," said Daphne Moore, spokeswoman for Wal-Mart Stores, based in Bentonville, Ark. "We are committed to looking for ways to make stores even safer for our customers and associates." Joe LaRocca, senior asset protection adviser for the National Retail Federation, said the trade group worked with retailers to come up with its own guidelines for managing crowds during special events, including the day after Thanksgiving, known as Black Friday because it is traditionally considered the day stores break into profitability for the full year. "Following the incident last year, retailers took another look at their crowd control and major event guidelines," he said. "Many retailers already had these guidelines; some enhanced what they had." Best Buy ran rehearsals for Black Friday weekend, practicing lining customers up, placing products in the store, checking out overall flow and how the event may flow within the store. Other companies have worked closely with mall operators on where to form lines and how they might better communicate with customers. They have been examining staffing plans and hiring extra security. Wal-Mart signed off in May on an agreement with local prosecutors that required it to overhaul security for Black Friday sales in its 92 New York locations, but it recently said it is employing its new strategy nationwide. 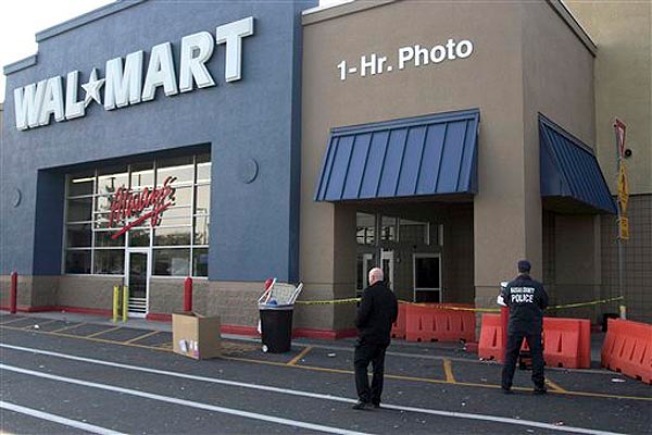 The settlement also required Wal-Mart to consult with experts to develop safety plans for each store. Crowd-management staff will be deployed, and maps will show customers where the hot sale items are. Stores will also place the hottest items — marked-down TVs, toys and laptop computers, for example — far apart to prevent big crowds from gathering. Wal-Mart will also erect barriers to manage traffic flow and distribute wristbands to customers on items with limited inventory. Security monitors will help ensure procedures are being followed, officials said — not just guards, like Jdimytai Damour. At 6-5, 270 pounds, Damour was built like NFL linebacker, but he was no match for an estimated 2,000 people who broke down the doors when the Valley Stream Walmart opened at 5 a.m. on Black Friday last year. Damour, who was 34 and described by friends as a "gentle giant," had been hired only days before. He was trapped inside the vestibule and died of asphyxiation. Several other people, including a pregnant woman, were injured. A criminal investigation forced Wal-Mart Stores to revamp security planning for the holiday season and led federal regulators to issue safety recommendations for all merchants conducting special events like Black Friday sales. Damour's family is suing the retailer and Nassau County officials, claiming police could have controlled the crowd better, although police contend that was Wal-Mart's responsibility. Edward H. Gersowitz, a lawyer for the Damour family, says "positive discussions" continue with Wal-Mart about a possible settlement. The federal Occupational Safety and Health Administration cited Wal-Mart for inadequate crowd management, but the retailer is appealing. The National Retail Federation, the industry's largest group, said Damour's death is believed to be the only instance of a store worker dying in the post-Thanksgiving rush. Police said customers stepped over or on Damour's body as they forced their way through sliding glass doors. "I think the people themselves were at fault because they were like animals, wild people," Joe Staskowski, of Valley Stream, said on a recent trip to the store. "And for a couple of dollars for people to get hurt or killed? It's a tragedy." Nassau County District Attorney Kathleen Rice contended that had Wal-Mart been found guilty of a crime, the maximum penalty it could have faced was a $10,000 fine. Instead, the store agreed to a $400,000 compensation fund for victims and donated $1.5 million to county social services programs and nonprofit groups. So far, only three people have qualified for payments from the victims' fund, a Rice spokesman said. They had to prove they were at the store that morning and provide documentation of any physical injury or damage to possessions. Among the survivors last year was Leana Lockley. The 29-year-old Queens woman was five months pregnant when she was caught up in the stampede and found herself being trampled. Her attorney says she credits Damour with helping save not only her life, but also that of her daughter, Alicia Skye Lockley, who was born in April. She, too, has sued Wal-Mart but is negotiating a possible settlement, said attorney David Sloan. "I believe that there are many lessons to be learned from this tragic incident and I do hope and pray that this year will bring a happy, festive and orderly time for all."